Here is an adorable set for baby's first Thanksgiving! 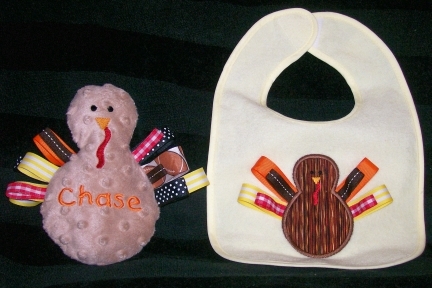 Bib features an applique turkey with ribbon loops tail! Soft, minky fabric plush toy feature embroidered details with ribbons loops that infants love! Add name at no extra charge! You can purchase as a set or individually. Also available in a "girly" turkey with pastel ribbons!